Like other types of investments, all crowdfunding campaigns are not created equal and one campaign can vary significantly from the next. There are two main types of crowdfunding investments on which we will focus here: reward-based crowdfunding and equity crowdfunding. However, it is important to realize that these are not the only types of crowdfunding available for investors in today’s market. In addition, there are many guidelines, requirements and regulations differing for each type of crowdfunding. 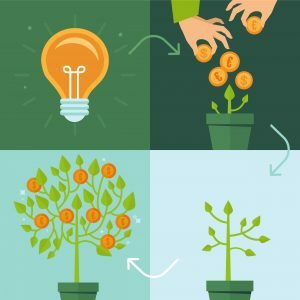 In a reward-based crowdfunding campaign, an investor will donate to a start-up or a business to help fund a new service or product. Instead of getting money in return for the investment, the business owner will offer some type of reward – usually a free product or a perk. While it may feel good to help fund a new venture and help an entrepreneur succeed, there is little you can expect in return when you invest in this type of campaign. For example, you may receive a t-shirt or free video game when you donate. If the company you contributed funds to is later sold for billions of dollars, you would not see any piece of that pie even though you helped fund the venture. Equity crowdfunding is a newer type of investment that is on the rise. Investors contribute funds to a company and receive an ownership stake in a new company. The risk is high, as many start-ups may not be as successful as others. However, if a company you contributed funds to experiences a windfall, a relatively small investment can have a huge return after a few years. Equity crowdfunding is similar to angel investing but it opens it up on a global scale thanks to the Internet. Originally, equity crowdfunding was only available to investors who were accredited by the SEC, meaning they have $200,000 in annual income for the past two years and they have $1 million or more in assets, amongst other requirements. However, the SEC opened up the equity crowdfunding market to non-accredited investors this past year. It is important to have a careful and diversified investment plan to profit from this type of crowdfunding. If you are considering being an investor in a crowdfunding campaign or if you want to launch your own crowdfunding campaign for your company, the experienced start-up and business lawyers at Structure Law Group, LLP can help you evaluate your options. We provide skilled advice and guidance for business operations seeking funding. Contact our office at 408-441-7500 today.